Home » How to watch Blu-rays and DVDs on Android phones? No doubt Android has been gaining the smart phone market. According to the report of NPD Group, in the first quarter of 2010, unit sales for Android OS smartphones ranked second among all smartphone OS handsets sold in the U.S. BlackBerry OS holds 36% ranked first, Android OS holds 28% ranked second, and Apple’s iOS holds 21% ranked third. Supposing you are one of those people who wanna be ahead of others and have the latest smartphone with the newest technology, you need get an Android phone, like Motorola Droid X, HTC Evo 4G, HTC Legend, Nexus One, etc., without any excuses. The following guide will be of some help for you to get more fun to watch Blu-rays and DVDs on Android phones. Part I. Can I watch Blu-rays and DVDs on Android phones? In fact, Android phones have no native supports for Blu-rays and DVDs. To watch these movie sources on Android phones, you have to rip Blu-ray and DVD movies to Android phones compatible video formats (.mp4 for example) in advance. Generally speaking, Blu-rays and DVDs , which means you have to use a Blu-ray DVD to Android converter to convert Blu-ray and DVD to Android supported file format. The guide below introduces you an easy way to rip Blu-ray and DVD movies to Android phones within only 4 simple steps. Part II. 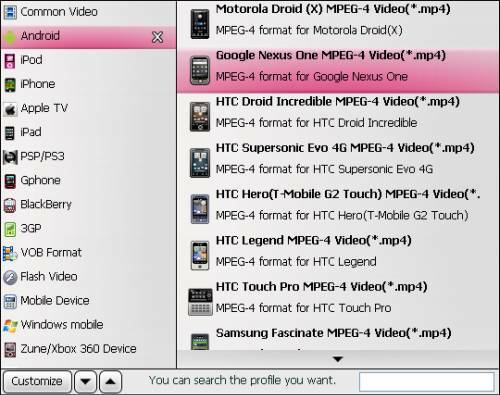 How to watch Blu-rays and DVDs on Android phones, like Motorola Droid X, HTC Evo 4G, HTC Legend, Nexus One, etc.? You can click “BD/DVD ROM”, “BD/DVD Folder” or “IFO/ISO” icon to load Blu-ray or DVD movie files. Notice that BD ISO image file can only be loaded from a virtual BD drive. Click on the drop-down list of “Format”, and then strike “Android” option. After that you will see the following window which provides you with multiple format presets optimized for Android phones, including Motorola Droid X, HTC Evo 4G, HTC Legend, Nexus One, HTC Legend, HTC Touch, and more. You are free to select anyone of them as output format on the basis of the brand and model of your Android phone. To watch Blu-rays and DVDs on Android phones in best quality, you can click “Settings” button to adjust audio and video parameters like codec, aspect ratio, bit rate, frame rate, sample rate, and audio channel to satisfy your higher expectation. Or you can use the default settings without adjusting any settings. Click “Convert” button to convert Blu-ray and DVD to Android phone. Pavtube Blu-ray DVD to Android converter adopts advanced audio and video in sync technology, which will ensure audio and video matching up very well. Once the conversion task is finished, click “Open” button to get the output files for your Android phones. 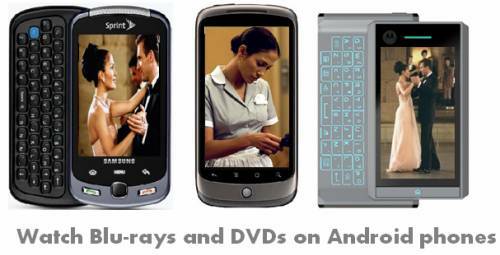 Now you are ready to watch Blu-rays and DVDs on Android phones. Have fun. 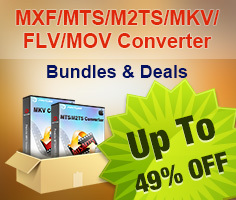 If you are using a Mac computer, the Mac Blu-ray DVD to Android converter would be your suitable choice.